Regardless of the circumstances of a bicycle or pedestrian accident, it is important for victims and their families to seek the counsel of experienced pedestrian or bicycle accident lawyers. Bicyclists, like all others who use city streets, have a responsibility to operate bicycles in a safe manner, with due respect for rules of the road and the often unpredictable actions of other drivers and riders. Likewise, pedestrians are expected to obey traffic signals, cross in crosswalks where they are available, and in general, practice safety just as motorists and bicyclists must. 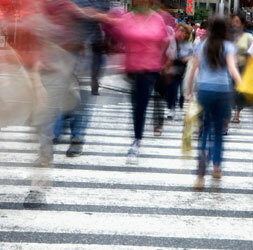 Bicycle and pedestrian accidents can happen anywhere, but they are most common in congested city traffic. Cars, buses, bicyclists, and pedestrians often weave in and out of traffic as they attempt to get from Point A to Point B without delay. Bicycle and pedestrian accident lawyer Ronald Bell offers injury victims the benefits of 35 years of experience as a dynamic, effective trial lawyer. Past clients of Mr. Bell’s have succeeded in obtaining large settlements and verdicts which enabled them to go on with their lives at home, in dignity, after a serious bicycle or pedestrian accident. Don’t let insurance companies make decisions for you. Seek personalized representation from a dedicated and experienced personal injury lawyer. To schedule an initial consultation with experienced Illinois personal injury attorney Ron Bell regarding any pedestrian or bicycle accident, including hit and run accidents, crosswalk accidents, poorly maintained sidewalk trip, slip and fall hazard accidents, or other types of accidents such as escalator accidents or amusement park accidents, contact Ronald L. Bell & Associates, P.C. by email or give us a call at 847-495-6000. The law offices of Ronald L. Bell & Associates, P.C., located in Libertyville, Illinois, offers experienced, full-service legal counsel and representation throughout the Northern Illinois area, in Lake County, Cook County, McHenry County, DeKalb County, and Kane County, in communities including Wheaton, Aurora, Arlington Heights, Lombard, Elmhurst, Markham, Skokie, Rolling Meadows, Winnetka, Rosemont, McHenry, Geneva, Elgin, Naperville, Woodstock, Algonquin, Waukegan, Mundelein, Libertyville, Northbrook, Deerfield, Evanston, and Crystal Lake, in a range of practice areas including personal injury, medical malpractice, criminal defense, DUI / drug possession defense, family law, and business. 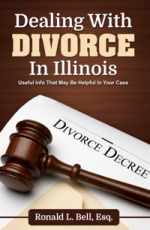 Ron Bell wrote the book on Divorce in Illinois. Click here for free copy. Ronald L. Bell & Associates P.C. represents clients in Libertyville and throughout Northern Illinois, in areas including Chicago, Naperville, Vernon Hills, Gurnee, Barrington, Buffalo Grove, Deerfield, Fox Lake, Grayslake, Highland Park, Bannockburn, Lake Bluff, Lake Forest, Lake Villa, Lake Zurich, Lincolnshire, Lindenhurst, Mundelein, Waukegan, Zion, Crystal Lake, River Woods, Deer Park, Round Lake, Palatine, Rolling Meadows, Inverness, Prospect Heights, Arlington Heights, Schaumburg, Lake County, Cook County, McHenry County, Dupage County and Kane County.